"I'm going to prove that Finnegans Wake is an information pool based on computer memory systems that didn't exist until centuries after James Joyce's era; that Joyce was plugged into a cosmic consciousness from which he derived the inspiration for his entire corpus of work." 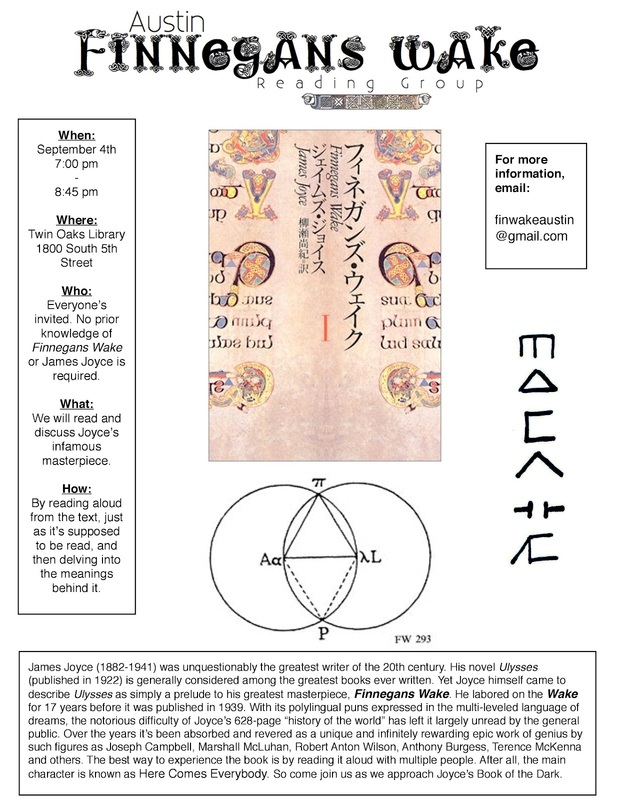 The Finnegans Wake Reading Group of Austin will have its first official gathering Tuesday, September 4th starting at 7 PM at the Twin Oaks Library in South Austin. This event is free and open to the public. Everyone is welcome, you don't have to have any particular interest in James Joyce or his work. But do be prepared to read aloud in front of people. I have a meeting room reserved at the Twin Oaks Library (a really nice place located near South Lamar and Mary Street) from 7 to 8:45 PM for the first Tuesday night of each month moving forward. If it goes well, maybe we'll even get together more frequently than once a month. 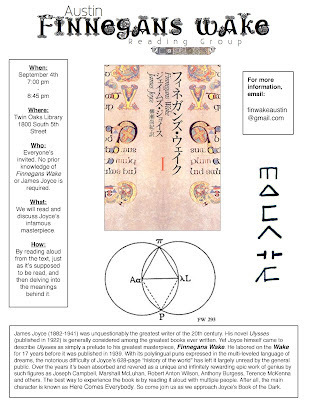 We're going to approach the text in the manner outlined in an old post I wrote called the Finnegans Wake Treasure Map, going through the easier chapters first and slowly moving on through the more difficult ones. This is the order I've been reading the book myself and I've found that it works perfectly, especially since it starts off in Chapter 5 (known as the "Mamafesta" chapter) which deals entirely with describing the book itself as though it were an old letter with complex writing and symbols dug up out of a garbage dump. Any questions or concerns, feel free to send an e-mail to finwakeaustin@gmail.com.